Our line handler crew (Travis, Danny, Dave?, me (Brody), Jami, Megan, Jack, Sean, Tom, Audrey). This is the last post on ships for a while. I've caught up and there aren't anymore coming in. Four or five ships coming to port doesn’t warrant having anyone line handle as their job so management just solicits volunteers. You go to a short training session on how to not get yourself killed, are given a pager so they can let you know when the ship is coming, and then you are set as an official line handler. Some people volunteer because they want a little more variety in their job. Others volunteer because they hate their job and want a break. Some do it because it is just something new. Others do it because it is a way to see something up close that you can't see otherwise. Whatever the reasons, sometimes we got out of work to line handle. Sometimes, we got out of bed. Pulling in one of the heavier lines. 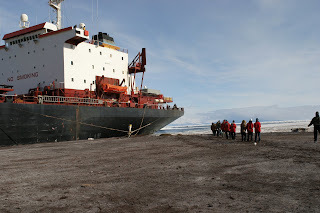 When a ship pulls up, it is pretty close to stopped on its own. The lines are just to keep it from drifting or to help it parallel park. (Is there a word for ship parallel parking?) They would tie a very light weight line to the heavy line. At the non-tied end of the light weight line, they'd make something called a monkey fist, which is basically a golf ball wrapped up with rope and throw them to us. "Watch out for the monkey fist." Don't try and catch the monkey fist." I can't tell you the number of times I heard this. Apparently, they are harder than baseballs, coming down from a couple stories, and more than able to knock on your rump if you got hit in the wrong spot. You let it hit the ground and then go pick it up. Everyone grabs the rope and pulls until they get to the big line. Then we grab the big line and pull it in and toss it on the oversized cleat. Pulling in another stern line. I think this picture is actually us casting off the ship. I'm not sure. 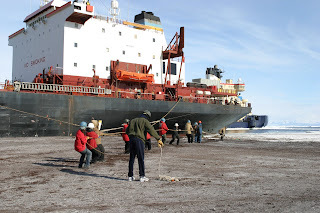 Pulling on the rope would normally imply we were tying it up, but we had cleats on shore and a wire running from shore to the ship's rope. To make sure our loose end of the wire didn't end up in the water, we had to pull the wire back to the pier before untying the ship. The last time we did this, we got smart and used a truck to pull in the wire. We couldn't use the truck on the light weight lines because they'd snap. "And now, here's something we hope you'll really like" (in your best Rocky, the cartoon squirrel, voice). If I had the pleasure of working on one of these vessels, I'd get to see a lot more of the continent (as you suggested, Nancy). One of those things that I'd get to see is glacier calving as they melt away and lose their structural stability. Make sure to watch both of these videos. Just amazing!! They are from the same trip, I think. I have enjoyed reading your blog. Very informative. whoa!!! that's crazy! everybody get off deck!